Merged into Mount Horeb, 02/18/2017. "Happy the people whose annals arc blank in history-books." So said Thomas Carlyle, borrowing the idea from Montesquieu. By this criterion Somerville Lodge has been happy. The story of its quarter century of life is unmarked by any of the crises or struggles which make history. The years have passed in orderly and successful progress. We have lived and flourished and done our work. I think I may say well. Some interest does, however, attach to the beginnings. Unfortunately there are no records, so far as I can ascertain, of the preliminary meetings which led up to the formation of the Lodge. It is fortunately not so long ago that the memory of participants cannot measurably supply the omission. Conditions in West Somerville in 1912 were not only favorable for a new Lodge but appeared to demand one. The section was not convenient to Gilman Square where the three existing Lodges held their meetings. There had grown up in the Davis Square section a very flourishing community full of excellent Masonic material. It was well provided with Protestant churches, five in number. There were excellent school facilities. There was a branch public Library which had a very extraordinarily large patronage, a fact which testifies eloquently to the surrounding social conditions. Several meetings of interested Masons of the vicinity were held and it was decided to petition the Grand Master for a Dispensation. The movement was hailed with enthusiasm and when the petition went in it was signed by one hundred and twenty-four Brethren. The officers named in the Petition were for Master Frederick W. Hamilton, a Past Master of Washington Lodge, for Senior Warden Albion H. Libbey, a Past Master of Soley Lodge, and for Junior Warden Alfredda R. Hersam, a member of Hope Lodge. Bro. Hersam unfortunately died in 1922. Bro. Libbey, affectionately known to many of us as "Pa Libbey," is still living at the ripe old age of eighty-six. There was considerable discussion as to the name and a considerable number were proposed. The name "Somerville" was finally decided upon. The decision was largely influenced by the pride the Brethren felt in their good city and the fact that though there were three Lodges in Somerville there was no Somerville Lodge. The Petitioners made one very wise decision which greatly influenced the future financial stability of the Lodge. The question of how much the petitioners should be assessed for the support of the Lodge until regular revenue should be available was discussed at some length. At first opinion was strongly in favor of making the assessment five dollars, an amount equal to one year's dues of the neighboring Lodges. It was finally decided to fix the assessment at ten dollars and it is pleasant to record that not one of the petitioners offered any objection. At that time it was necessary to file with the Petition the assent of the Lodges having jurisdiction and the approval of the District Deputy Grand Master for the District. These approvals were obtained without difficulty, although they were far from perfunctory. The Masters of the Lodges took their responsibility very seriously and made careful investigation. I very distinctly remember my interview with R. W. Robert W. Oliver, who was then our District Deputy Grand Master. R. W. Bro. Oliver was kindly and sympathetic — no one can imagine him otherwise — but he was decidedly "from Missouri;" he wanted to be shown. Apparently he was shown, for his approval was graciously given. Quarters were rented in a building nearly opposite the one we now occupy. The Lodge used a room which was of ample size and reasonably convenient, but which was also used by several other fraternal organizations. It was not altogether satisfactory, but was the best we could do at the time. On December 7, 1912, Grand Master Everett C. Benton did us the honor to visit us in person and deliver our Dispensation. What was done was unusual and if done by anybody but a Grand Master, would have to be called irregular. Quite ignoring the common law of Masonry that officers of Lodges Under Dispensation are not installed, the Grand Master not only delivered the Dispensation but installed the officers. Supper was served after the ceremony to the large company present. New Lodges were not as common then as they became later and the ceremony was probably new to the greater part of those present. It was really a gala occasion. Robert F. Gibson, M. D.
The first meeting for the work was held on December 23 and twenty-nine applications were received, convincing proof that the new Lodge was eagerly and largely awaited. That the approval of the Somerville Lodges was not a mere gesture was proved by a generous gift from the Lodges of a beautiful set of officers' collars and jewels. From Bro. Arthur F. Keating, an ebony gavel. From Bro. Frank D. Wilkins, an altar bible. From Bro. Joseph H. Perry, a plush lined case for the square and compasses. From Bro. William B. Brown, a nickel plated case for the Dispensation. From Bro. William F. Dodge, a gavel, baton, and truncheons. Petitions continued to come and the load of work thrown upon the officers during the first year was very heavy. In order to clear the decks for a July and August vacation the Lodge met five times in June, 1913, and worked two degrees at four of these meetings. In that month ten were initiated, eight passed, and twenty raised. The officers of that year deserve great credit for the loyal and self-sacrificing support they gave the Master. A cursory reading of the records would probably cause some surprise at the large number of cases in which investigating committees were given further time. This was not because of the doubtful character of the applicants, but because the Master, at the first meeting, announced that during his term of office he would allow no ballots on majority reports of committees and adhered strictly to the policy thus announced. The first application received in Somerville Lodge was that of Hon. Elmer A. Stevens, then Treasurer of the Commonwealth. Bro. Stevens was the first candidate raised in the Lodge. On this occasion all the chairs were filled by visitors prominent in the Masonic and political life of the state. It was an auspicious beginning of the work of the Lodge. The officers installed to serve under the Charter were the same as those who had served under Dispensation except Bro. Alvah G. Sleeper as organist vice Bro. Davis, deceased. The Lodge presented the Grand Master one hundred dollars for the Masonic Home. The annual meeting was held November 10 and new officers were elected. The reports showed a membership of 162 with a balance of $1,917.69 in the treasury. One thousand dollars of this was transferred to the permanent fund. The Lodge was now fairly started on a career of prosperity which has continued to this day. The Lodge was not long satisfied with its quarters. As early as 1915 it began casting about for better accommodations. The other Somerville Lodges were sounded with a view to the erection of a centrally located Temple for the occupancy of all the Masonic bodies in the city. The other Lodges, however, were content as they were and the conferences led to nothing. After negotiating with several parties an arrangement was made with S. H. Lewis and Son who were about to build a new block. The apartments which we now occupy were built according to plans agreed upon and leased to the Lodge on mutually satisfactory terms. The furnishings of the apartments cost $3,000.00 of which $1,000 was contributed by the members and the remainder drawn from the permanent fund. Arrangements were made for the use of the apartments by Fraternal Chapter No. 136 and Highland Chapter No. 35, Order of the Eastern Star, each Chapter assuming part of the rent. This arrangement was highly satisfactory and is still in force. On May 28, 1917, the Lodge met and was opened in the old apartments. It then marched across the street to the new apartments and in due time was there closed. On June 21 the new apartments were dedicated by M. W. Leon M. Abbott, Grand Master, and the Grand Officers. An incident of the evening was the presentation of a state flag on behalf of the members by Wor. Albion H. Libbey. Bro. John H. Derby presented a clock for the Lodge-room, and Bro. (later Worshipful) Alvah G. Sleeper loaned an organ. On the entrance of the United States into the World War the Lodge voted to remit the dues of all members who might serve in the armed forces of the country, and to procure a service flag. The flag was presented later by Bro. Eugene A. F. Burnett. By an interesting coincidence the annual election of 1918 fell on Armistice Day, November 11. Somerville Lodge shared the growth which came to all our Lodges during and immediately after the war. The membership August 31, 1916 was 260. On August 31, 1921, it was 660. The membership continued to grow until it reached 933 in 1931. Then came the years of depression, and on September 1, 1937, it had fallen to 755. On May 24, 1920, a petition was read, signed by eighty-one Master Masons, for a new Lodge in West Somerville to be called Truth Lodge. Somerville Lodge consented by unanimous vote. The other assents necessary as the law then stood, were not obtained and the petition never reached the Grand Master. At the annual meeting on November H, 1920, Bro. Charles W. Hodge, who had served his Lodge as Secretary faithfully and efficiently from the beginning, declined further service, and Wor. Arthur J. Keating was elected to succeed him. Bro. Hodge died December 2, 1924. During 1920 the question of Quarters again came to the fore. The Lodge voted not to move to Gilman Square, and a committee was appointed to consider new quarters, but nothing came of it. At the annual meeting in 1927. Wor. Arthur J. Keating, after seven years service as Secretary, declined re-election. His admirable and efficient service was recognized a little later by a set of resolutions expressing the appreciation of the Lodge. His place was filled by the unanimous election of our present Secretary, Bro. Arthur R. Kinder, prized by our members alike for his excellent work and his admirable personality. A revision of the by-laws adopted in 1930 set our financial house in order. The Lodge runs on its dues. All fees are earmarked for charity. All life membership fees go into a separate fund] the principal of which may not be touched, the interest going into current account. The next year, 1931, saw the carpeting and renovation of our apartment. This removed the cause of discontent and set the question of removal at rest. We have no desire to move: indeed within a few weeks we have renewed our lease for a term of years. In 1933 we were fortunate enough to get an exceptional opportunity to purchase a pipe organ at a very low price. The splendid instrument which we now enjoy cost us, thoroughly reconditioned and installed, a little less than four thousand dollars. Somerville Lodge has been fortunate in the uneventful nature of its history. There have been no crises, no perplexing problems, and best of all, no dissentions. We have shared with the rest of the Massachusetts Lodges the prosperity of the fat years and the depression of the lean years, but the depression at no time threatened our stability. We have accumulated permanent funds which now amount to $29,000. The administration of these funds has been neither extravagant nor niggardly. When needed they have been used for furnishings, for the organ, and for charity, but in every case the expenditure has been justified by the results. Several of our Past Masters have been honored by appointment or election to Grand Lodge offices. Wor. T. Walter Sharpe served as Junior Grand Steward, R. W. J. Arthur Gibson served as District Deputy Grand Master and later as Senior Grand Warden, R. W. Stanley W. Wilson served as District Deputy Grand Master. Our first Master was installed Deputy Grand Master December 27, 1914 and at the March Communication following relinquished that office to accept election as Grand Secretary, an office which he still holds. On December 11, 1935, he received the signal honor of election as Honorary Past Grand Master. Somerville Lodge has always borne its part in the special financial efforts made by Grand Lodge, the War Relief Fund, the Rainy Day Fund, the Hospital Fund, and the subscription for the George Washington Masonic National Memorial. We have reason to be proud of our quarter century of achievement. We stand today united in our devotion to the pure principles of Freemasonry. We look forward with confidence to a future in which we shall, as always, keep our altar-fires burning clear. By R.W. Norman A. Ray. Perhaps a precedent was started back in 1937, when the writer, as the 25th Master of Somerville Lodge, requested M. W. Frederick W. Hamilton, our first Master, to write the history of the Lodge at the time of the 25th Anniversary, because now, twenty-five years later, Wor. Bro. Morrison, our 50th Master, has invited me to write the history on this happy occasion, our 50th Anniversary. Who knows but that this procedure may be repeated twenty-five years from now and Wor. Bro. Morrison may be privileged to be the historian at the 75th Anniversary. I do not intend to repeat in full the history so ably prepared by M.W. Bro. Hamilton, but I might say that a few copies are available from our Secretary who, I am sure, will be glad to loan one to any member desiring to read same in its complete form. Also any Brother may refer to Pages 196 to 207 inclusive of the 1937 Proceedings of our Grand Lodge for an account of that celebration. These Proceedings are here in our Lodge Library as well as in the Grand Lodge Library in Boston and may be borrowed at any time. "Happy the People whose annals are blank in history books." So said Thomas Carlyle borrowing the idea from Montesquieu. By this criterion Somerville Lodge has been happy. The story of its quarter century of life is unmarked by any of the crises or struggles which make history. The years have passed in orderly and successful progress. We have lived and flourished and done our work, I think I may say, well. That same paragraph could well serve as the opening of this paper merely by substituting the words "half century" for "quarter century," for indeed Somerville Lodge has moved along in an orderly and successful fashion for these past fifty years. Why was the name Somerville chosen for this Lodge? According to M.W. Bro. Hamilton many names were proposed, and again I quote from his history: "but the decision was largely influenced by the pride the Brethren felt in their good City and the fact that though there were three Lodges in Somerville, there was no Somerville Lodge." On December 7, 1912, the Dispensation was delivered in person by the Grand Master, M. W. Everett C. Benton, who was accompanied by a Suite of twelve Grand Lodge Officers. "What was done was unusual, and if done by anybody but a Grand Master would have to be called irregular. Quite ignoring the common law of Masonry that Officers of Lodges under Dispensation are not installed, the Grand Master not only delivered the Dispensation, but installed the Officers. Supper was served after the ceremony to the large Company present. New Lodges were not as common then as they became later and the ceremony was probably new to the greater part of those present. It was really a gala occasion." Seventy-eight Brethren signed the petition and all became Charter Members with the exception of two, who died before the Charter was issued. We are particularly honored to-night by having the only living Charter Member of those seventy-six Brethren present, our Past Master and present Chaplain, Wor. Earle W. Edwards. Over these many years, he has continued to serve his Brethren in many ways and we salute him to-night as a true and loyal Mason. May he live long to continue his interest in the work of our Lodge. Twenty-nine applications for the degrees were received at the first meeting, December 23, 1912, and it is needless to say that the officers had plenty of work to do during the first year. "In order to clear the decks for a July and August vacation the Lodge met five times in June 1913, and worked two degrees at four of these meetings. In that month ten were initiated, eight passed, and twenty raised. The Officers of that year deserve great credit for the loyal and self-sacrificing support they gave the Master." The Lodge was constituted on October 13, 1913 by M.W. Everett C. Benton, Grand Master, with a suite of 31 Grand Lodge Officers. In 1915, the Lodge Apartments not being entirely satisfactory, search for better accommodations was started. The other Somerville Lodges were approached relative to all going in together in one Temple, but they were not interested. As a result, Somerville Lodge moved across Holland Street into a new block, known as the Lewis Building. The furnishings cost $3000.00, of which $1100.00 was contributed by the members and the remainder drawn from the Permanent Fund. These apartments were dedicated June 21, 1917 by M.W. Leon M. Abbott, Grand Master, and the Grand Lodge Officers. At that time, one of our members, Bro. Alvah G. Sleeper, later to become our 10th Master in 1922, loaned the Lodge a reed organ which was used until the purchase of our present pipe organ in 1933. During the busy years that followed, the writer pumped the pedals of that old organ many times while substituting for our regular organist, Bro. Charles P. Potter, who incidentally was our organist for thirty years from 1917 to 1947. On May 24, 1920 a Petition was read, signed by eighty-one Master Masons, for a new Lodge in West Somerville to be called Truth Lodge. Somerville Lodge consented by unanimous vote. The other assents necessary as the law then stood were not obtained and the Petition never reached the Grand Master. On September 27, 1926, a motion was made by the Secretary that our By-Laws be amended.to conform to the requirements of the Amendment adopted by Grand Lodge at the September Grand Lodge Communication requiring all subordinate Lodges to change their By-Laws in order that the Fiscal Year would correspond with that of the Grand Lodge, that is, from September 1st to August 31st of the following year. This was so voted. In 1926, the Lodge held twenty-seven Communications, eleven Regular and sixteen Special, and received forty applications for the Degrees and three for Affiliation. In October of that year, the Lodge gave $100.00 to the Florida Relief Fund following a hurricane, and the following May contributed $250.00 to those suffering from a flood casualty in Mississippi. At the Annual Meeting in 1927, Bro. Arthur R. Kinder was elected Secretary and served faithfully and efficiently in that important office until his death September 10th of last year, a period of almost thirty-five years. One of our candidates in 1927 was Bro. Herbert Ashton, Jr., an actor with the Somerville Stock Company which played for many years in the theatre downstairs. As many will remember, this was a very fine Stock Company and provided excellent entertainment for all who attended. When Bro. Ashton was scheduled to take his Entered Apprentice Degree on January 17, 1927, it was necessary for the Lodge Officers to wait until the show ended as he was playing the leading role. The writer well remembers that night because he was serving as substitute organist for the first time in the Lodge. Either the music was so bad or for some other reason but Bro. Ashton fainted dead away during the Master's lecture. He recovered quickly and the work was continued with him sitting in a chair. The Lodge was not closed until about 11:45 P.M., a real late meeting I would say. On May 23rd, Bro. Ashton took his Master Mason's Degree and signed the By-Laws the next night, he having perfected himself in the Ritualistic Lecture in the twenty-four hours, thus demonstrating his remarkable proficiency in memorizing. There was no Lodge of Instruction for him to attend at that time, as the 13th Lodge of Instruction was not instituted until April 8, 1928. In reading the Lodge records while preparing this paper, I noted that on April 23, 1928, our beloved second Master, Wor. Albion H. Libbey, better known as "Pa" Libbey to all of us at the time, visited the Lodge and was given a royal reception. He and his wife were guests at the Masonic Home in Charlton at the time. On November 12, 1928, Wor. J. William Fielding recommended Bro. Alden M. Pillsbury for Honorary Membership, which was so voted at the next meeting. Bro. Pillsbury had been appointed Inside Sentinel March 22, 1926 and faithfully served in that Station until November 12, 1945. Bro. Pillsbury never desired advancement although during these nineteen years he served in many stations in the Lodge and was well prepared in the required ritual of all stations. He was one of the mainstays of Somerville Lodge. Upon assuming the East on November 12, 1928, Wor. Robert P. Jackson appointed Bro. J. Blair Ferguson as Assistant Tyler and he continued in that position until September 30, 1949, when he became Tyler, a position he still occupies and which he fills with great credit to himself and to Somerville Lodge. The first of our Past Masters to be appointed District Deputy Grand Master was our distinguished and faithful R.W. J. Arthur Gibson, who made his first Fraternal Visitation to our Lodge on January 28, 1929, accompanied by a large Suite of prominent Masons. He was royally received. In addition to this high office, R.W. Bro. Gibson was to receive further Masonic Honors in Grand Lodge, all of them well deserved. On May 6, 1929, a very fine fraternal relationship with Mt. Horeb Lodge of Woburn was initiated by Wor. Bro. Jackson of our Lodge and Wor. Johannes Sorenson of Mt. Horeb Lodge in the form of a visitation by the officers of the Lodges each year for the purpose of conferring the second and third sections of the Master Mason Degree, the work being done by the officers of the visiting Lodge. This relationship has continued without interruption and the writer sincerely hopes that it will never be discontinued as it has created only the finest of fraternal relations between the officers and members of the two Lodges. On May 27, 1929, an Amendment to the By-Laws was proposed raising the dues to $7.00 with the Past Masters being exempt from payment, but on June 24, 1929, the proposal was defeated by a vote of 51 to 33. However, the amendment was adopted on November 24, 1930. On November 17, 1930, our first Public Installation was held in the old Elks Hall on Central Street, at which time Wor. George O. Nelson was installed as Master by M.W. Dudley H. Ferrell, Past Grand Master. The writer remembers this occasion very well because he furnished the orchestra for the dinner and dancing which followed. A very large audience gathered for this innovation as it was definitely something new for Somerville Lodge at that time. However, in the present day, Public Installations seem to be more prevalent than the former tiled Lodge installations. With Wor. T. Walter Sharpe as Master in 1931, the Lodge-Room was renovated and recarpeted although the carpet is now beginning to show the results of so many footsteps upon it over these thirty-one years of service. On November 4, 1932, Wor. George O. Nelson presented to the retiring Master, Wor. Bro. Sharpe, a bound volume of the Notices during his term of office. This was an innovation in our Lodge, but this happy practice is still being carried on. In 1933, with Wor. Walter C. Smith in the East, our pipe organ was purchased and installed at the remarkably low figure of less than $4000.00. Such an instrument today would undoubtedly cost double that price. It, too, is beginning to show its age, but with good hands at its console has furnished very lovely and inspiring music over the years and has added a great deal to the impressiveness of our degrees. On January 22, 1934, Bro. Abel W. Reynolds, who had served eight years as Treasurer, was elected an Honorary Member and upon his retirement from the Treasurer's position R.W. J. Arthur Gibson was elected to that office and served until November 9, 1953, when he was forced to relinquish the office due to his health. The writer, who had been serving as Acting Treasurer since January 1953, was then elected to succeed R.W. Bro. Gibson. On February 18, 1935, a reception to R.W. J. Arthur Gibson, newly elected Senior Grand Warden, was held at the Apartments in his honor with M.W. Claude L. Allen and a large Suite in attendance. As this was the first reception of its kind in our Lodge it was most interesting. On February 28, 1938, with the writer in the East, a proposal to amend the By-Laws of the Lodge eliminating the 25-Year Automatic Paid Up Membership was defeated after a lengthy discussion. In September 1939, with Wor. Herbert A. Brown as Master, the officers visited Dunlap Lodge in Biddeford, Maine, and exemplified the Master Mason's Degree. It was one of the hottest nights of the year and no one could say that we were not warmly received by our Brethren in Maine. On November 13, 1939, the financial condition of our Lodge was brought to the attention of our membership by R.W. Bro. Gibson, Treasurer, who predicted that unless the Lodge took immediate steps to remedy the situation, we would have no dues paying members by 1948. He quoted from addresses by M.W. Bros. Claude L. Allen and Joseph Earl Perry during their terms as Grand Master and more particularly to the fact that M.W. Bro. Perry had stated that he would step in if Lodges did not take the necessary steps to put their own financial condition in order. As a result of this, on January 22, 1940, a new committee was appointed by the Master, Wor. Hiram N. Dearborn. This committee consisted of Bro. William Hodge, Chairman, with Bros. Harry Fallis, Charles F. Hathaway, Roy V. Macdougal and the writer as the other members. This Committee worked long and tirelessly on this important matter and on May 27, 1940, brought in its report recommending the immediate elimination of the 25 Year Automatic Life Membership and the cancellation of the exemption of Past Masters from the payment of dues. Considerable feeling was engendered during the discussion as you can well understand, but nevertheless the Lodge voted to adopt the report of the Committee, and once again the financial picture of Somerville Lodge was in a favorable position. On November 27, 1939, Bro. Alden P. Pillsbury received the Veteran's Medal as a 50-Year Mason. On May 22, 1940, the Lodge was saddened by the passing of our beloved first Master, M.W. Frederick W. Hamilton. In passing it should be said that M.W. Bro. Hamilton was one of only two Brethren to be elected Honorary Past Grand Master of Masons in Massachusetts. On October 5, 1940, the officers of Dunlap Lodge of Biddeford visited Somerville Lodge and exemplified the Master Mason Degree according to Maine Ritual. This was a very happy occasion, the work being very interesting and conferred in a fine dignified manner. On October 26, 1942, it was my privilege and pleasure as District Deputy Grand Master of the Arlington Sixth Masonic District to present to Bro. Alden M. Pillsbury the Distinguished Service Medal, also known as the Joseph Warren Medal, for meritorious service to his Lodge and to Masonry. Bro. Pillsbury was taken completely by surprise but his expression of appreciation was genuine and said in the typical Pillsbury style, so well known to some of us, who may be termed "Old-Timers." On December 12, 1943, R.W. J. Arthur Gibson was elected an Honorary Member of Somerville Lodge upon recommendation of the writer. On September 25, 1944, the District Deputy Grand Master, R.W. Seward E. Nichols, presented a Citation on behalf of the Grand Lodge for the excellent record made in raising funds for the Masonic Service Center at Ayer, Mass., near Camp Devens. As a matter of fact, Somerville Lodge topped all the Lodges in our District, a very worthwhile record. In addition many of our members, together with their wives, spent many evenings at the Center, serving as Hosts and Hostesses to the boys in the Service and our Past Master, R.W. Stanley W. Wilson, headed up the program for Grand Lodge. Also on this evening, the 80th birthday of Bro. Pillsbury was celebrated, and R.W. Bro. Nichols presented flowers to him in celebration of this happy occasion. On February 12, 1945, a reception to the new Deputy Grand Master of Masons in Massachusetts, our own Past Master, R.W. Stanley W. Wilson, was held with the Grand Master, M.W. Samuel Holmes Wragg, and a large Suite of Grand Lodge Officers present. On May 28, 1945, the Trustees of the Lodge were given authority to seek new quarters, as the Lewis Building had been sold and the new owner was planning to tear down the old building and build a new one. For our newer members, I would say that the new building is the Gorin Building on the other side of the Square just below us. A proposition was submitted by the new owner, but was not acceptable to the Lodge; so it became necessary to move and our present quarters were selected as ideal for our purposes. A sum of $20,000 was earmarked for the necessary expenses and on September 24, 1945, we held our first meeting here with Wor. Charles E. Gould in the East. Our twenty-year lease is drawing to an end and we now face the problem of renewal or again moving. At the Annual Meeting of November 12, 1945, Bro. Pillsbury declined reappointment as Inside Sentinel due to ill health. He had served faithfully for nineteen years and had been a tower of strength to the Lodge during all of that time. On May 27, 1946, the Trustees reported that the final cost of moving to our new quarters amounted to $23,249.75. At the meeting of September 30, 1946, some sort of a record was established by the absence of our Secretary, Bro. Kinder, it being the first time he had missed a Lodge Meeting since becoming our Secretary nineteen years previous on November 14, 1927. On March 24, 1947, with Wor. Earle W. Edwards in the East, the matter of increasing the dues was once again presented to the Lodge and again was voted down. At the next meeting, April 28th, a proposal to increase our Degree Fees was presented to the Lodge and again the members voted against such an increase. On June 23, 1947, the writer proposed that the sum of $100.00 be set aside each year toward establishing a 50th Anniversary Fund to help defray the expenses of our present celebration. Having experienced some difficulty in arranging the 25th Anniversary Celebration without enough money earmarked for that purpose, it was felt desirable that such a Fund be established. It was so voted. Bro. William Hodge, after serving 20 years as Chairman of the Auditing Committee, expressed his desire to retire on November 10, 1947. The request was granted with regret and the following Resolution was adopted: "Regrets his decision but is sincerely grateful to him for the long, conscientious and efficient service he has rendered to the Lodge." On February 23, 1948, upon motion by Bro. Kinder, the writer was elected to Honorary Membership, which honor was greatly appreciated, I assure you. Once again, this time on April 26, 1948, the matter of increasing our dues came before the Lodge when a motion to increase them to $10.00 was made by our Treasurer, R.W. J. Arthur Gibson, and on May 24, 1948, the Lodge not only voted this increase but also voted to increase our Degree Fees to our present figures. The Lodge was greatly saddened by the passing of that sterling Mason, Bro. Alden M. Pillsbury, on September 27, 1948, at the age of 84. On September 30, 1949, Brother J. Clifford Hardy died at the age of 76. He had served us faithfully as Tyler and Lecturer for some 23 years. R.W. Stanley W. Wilson, Past Deputy Grand Master, died suddenly on January 17, 1950, and five officers journeyed down to his home in Dennis to perform the Masonic Service. On January 23, 1950, Rev. Bro. David Fraser was elected to Honorary Membership, he having served the Lodge for many years as Chaplain. On December 12, 1951, in Grand Lodge, the writer was elected Senior Grand Warden and on March 3, 1952, a reception was held in his honor with M.W. Thomas S. Roy, Grand Master, and a large Suite of Grand Lodge Officers, together with many friends of mine being present. Needless to say this was a thrilling Masonic evening for me. On October 17, 1952, the George Washington Bi-Centennial Celebration was held at the College Avenue Methodist Church. This was preceded by a parade from Cutter Square to the Church with M.W. Thomas S. Roy and a large company of Masons taking part. The Aleppo Temple Shrine Band furnished music for the parade. The Aleppo Temple Chanters under the direction of Bro. Earl Weidner as organist filled the Choir Loft of the Church and M.W. Bro. Roy gave the address for the occasion. The five Lodges in Somerville took part and the Church was filled to overflowing for this very memorable occasion. The Committee in charge was made up of the two District Deputy Grand Masters, R.W. E. Stanley Beck of the Somerville 6th Masonic District and R.W. Howard A. Gray, our own Past Master and District Deputy Grand Master for the Arlington 6th Masonic District, and R.W. Norman A. Ray, Senior Grand Warden of the Grand Lodge. On May 25, 1953, Bro. David Price received his 50 Year Veteran's Medal surrounded by his six sons, and this was one of the banner meetings of the Lodge. On November 9, 1953, R.W. J. Arthur Gibson was unanimously elected Treasurer-Emeritus and the writer was elected Treasurer. On March 22, 1954, Wor. Howard A. Gray was elected to Honorary Membership. On August 15, 1954, a courtesy Masonic Funeral Service was held for Bro. Alfred D. Nute, a member of Humane Lodge #21, Rochester, N. H. Bro. Nute had been a Mason for 79 years and was 101 years of age at the time of his passing. On December 26, 1954, Wor. Edward L. Conn, Master, together with other Brethren, visited R.W. J. Arthur Gibson at his son's home in Belmont and in the presence of many of his family and relatives, presented a Citation as an Award of Honor for his great contribution to Masonry in general and to Somerville Lodge in particular. At the January 23rd, 1956, meeting, R.W. Bro. Gibson appeared at the Lodge for the first time in three years and thanked those present for the great tribute which had been paid him by the presentation of this Citation. This was the last time he was able to attend Lodge. On February 27, 1956, a testimonal meeting was held in honor of our Secretary, Bro. Arthur R. Kinder, in recognition of his 29 years' service as our Secretary. The Lodge room was filled for this meeting with many nice remarks being made about our honored guest. The June 25th, 1956, meeting was dedicated to three sterling members of the Lodge, Bros. John O. Edwards, J. Blair Ferguson and Ernest E. Pearce. These three brethren have always given of their best abilities for the good of the Lodge. At the December 17th, 1956, meeting Bro. Arthur R. Kinder was elected to Honorary Membership. The Lodge was greatly saddened on February 20th, 1957, to learn of the sudden passing of our esteemed Brother R.W. J. Arthur Gibson, at the age of 74. -He had been a tower of strength to Somerville Lodge during the many years of his membership. On June 3, 1957, with R.W. and Rev. Francis D. Taylor, Past Deputy Grand Master, in the East, a team of Methodist Ministers conferred the second and third sections of the Master Mason Degree on Rev. Bro. Arthur W. Newcomb, Jr., an Associate Pastor of the College Avenue Methodist Church. This was indeed a wonderful evening for all present, particularly Rev. Bro. Newcomb. During the summer of 1957, one of the hottest summers as well, some of the Brethren spent many nights laying a new floor in the banquet hall. It was a lot of work, but the results were well worth the number of hours spent on it. On April 28, 1958, the Kilwinning Club of Watertown visited the Lodge, dressed in their traditional kilts and accompanied by their Piper, and entertained the Brethren as they raised Bro. Robert A. Imlach to the Sublime Degree of Master Mason. This was another memorable evening at our Lodge. On September 28, 1958, a Citation was presented to Wor. Earle W. Edwards for the many hours of service he had and still is giving to the Lodge. The lucite rods now being used by our Deacons and Stewards were the gifts of Wor. H. Bayfield Linkletter, Past Master, and Bro. Gilbert R. Foster, now our Senior Deacon. On February 27, 1961, Wor. Earle W. Edwards and Brother John O. Edwards were voted Honorary Memberships. At our March 27th, 1961, meeting, it was announced that in support of the Blood Donor Program, the daughter of our Immediate Past Master Wor. Francis G. MacDonald had donated blood in the name of Somerville Lodge and since then she has made additional donations. Also at this meeting R.W. Herbert W. Rosen, District Deputy Grand Master, presented Veteran's Medals to Bros. William Hodge and William M. Forsyth. Our Secretary, Bro. Arthur R. Kinder, suffered a heart attack early in September and passed away at his home on September 10th, thus ending a long and faithful Masonic career. At the Annual Meeting of September 25, 1961, Wor. Thomas Steel, Jr., the immediate Past Master, was nominated and unanimously elected Secretary, thus becoming only the fourth Secretary of the Lodge in its fifty years' existence. At the meeting of November 27, 1961, our ever faithful and respected Tyler, Bro. J. Blair Ferguson, was elected to Honorary Membership, an honor well deserved. Also at this meeting, a Committee was appointed by the Master to investigate the financial situation of the Lodge. This Committee was composed of R.W. Norman A. Ray, Chairman; Wor. Bayfield Linkletter, Bros. George McLean, Benjamin Rosales and Carl Johanson, Jr.
At the March Meeting, the Committe reported its findings, the most important being that the Annual Dues be increased from $10.00 to $13.00 and at the April 23rd meeting, the Lodge unanimously voted to adopt the Committee's Report. It is to be noted that no dissenting remarks were made by any member present indicating that the members of Somerville Lodge are ever ready and willing to assume any necessary obligations for the good of the Lodge. On June 25th, Bro. Henry W. Birkemose was unanimously elected to Honorary Membership. Bro. Birkemose has, for many years, been a faithful member and later Chairman of the Apartments Committee, and his contributions to the welfare of the Lodge in this and many other respects is and has been of great value. Never desiring appointment as a line officer, he has been a true and loyal member of the Lodge and one of its most ardent workers, and well deserved this honor. Another notable event occurred at this meeting as R.W. Herbert W. Rosen, District Deputy Grand Master of the Arlington (6th) Masonic District and the immediate Past Master of the Thirteenth Lodge of Instruction, paid the Lodge a Fraternal Visit for the purpose of presenting the R.W. Norman A. Ray Attendance Plaque to Somerville Lodge for the largest attendance of its Officers and Members during the year 1961-1962 at the meetings of this Lodge of Instruction. This Plaque was presented to the Thirteenth Lodge of Instruction by R.W. Brother Rosen in honor of the writer and it was most fitting that Somerville Lodge should be the first Lodge in the Sixth Masonic District to have its name inscribed thereon. Wor. Alton B. Fowler, a Past Master of Sagamore Lodge and a Third Degree Instructor in the Thirteenth Lodge of Instruction, also presented a carrying case for this Plaque. In passing, it should be noted that the enthusiasm of Wor. Francis G. MacDonald, our Immediate Past Master, together with the loyal co-operation and support of many of the Lodge Members, was primarily responsible for the winning of the Plaque. Another very happy event during the year was the occasion of the Entering and Raising of Bro. Philip A. Keane by his father, our affiliated Past Master Wor. Elmer W. Keane. On October 6th, Brother James F. Morrison was installed the Fiftieth Master of Somerville Lodge and has the honor of presiding over the happy events of the celebration of our Fiftieth Anniversary. Having had the honor of presiding over the celebration of our Twenty-fifth Anniversary, I well realize how proud he must feel. At the regular meeting of October 22nd, the District Deputy Grand Master again paid Somerville Lodge a Fraternal Visit, this time to present to our Past Master and only living Charter Member, Wor. Earle W. Edwards, his Veteran's or Fifty-Year Medal. This was indeed a very happy occasion and Wor. Bro. Edwards was highly complimented for the many contributions he has made, not only to Somerville Lodge, but to the entire Masonic Fraternity over these many years. Somerville Lodge has been greatly honored during its fifty years by Grand Lodge in the election or appointment of some of its Past Masters to important positions in the Grand Lodge family: M.W. Frederick W. Hamilton, our 1st Master and Charter Member, was appointed Deputy Grand Master on December 27th, 1914, by M.W. Melvin Maynard Johnson, Grand Master, but only served in that position until March 10th, 1915, when he resigned to be elected Grand Secretary, a position he filled with great honor and ability until his death in May 1940. On December 11th, 1935, he was elected an Honorary Past Grand Master, being only the second Brother to receive this distinction in the history of our Grand Lodge. On the same date, he was awarded the Henry Price Medal, the most prized of all Medals awarded by our Grand Lodge. During his long Masonic career, he served two Lodges as Master, Washington Lodge, formerly of Roxbury but now located in Lexington and a member of the Somerville (6th) Masonic District, and our own Somerville Lodge. He was awarded the Veteran's or 50-Year Medal in 1931 and was elected an Honorary Member of eight other Lodges. R.W. J. Arthur Gibson, our 12th Master in 1925-26 and Treasurer of our Lodge from 1934 to 1953, was appointed Grand Sword Bearer in 1928 by M.W. Frank L. Simpson, Grand Master; District Deputy Grand Master of the Arlington (6th) Masonic District in 1929 and 1930 by M.W. Herbert W. Dean, Grand Master; and on December 12th, 1934, was elected Senior Grand Warden of the Grand Lodge. At his reception in Somerville Lodge on February 18th, 1935, he was awarded the Henry Price Medal. 1932, by M.W. Curtis Chipman, Grand Master. Somerville Lodge, February 12th, 1945. R.W. Norman A. Ray, our 25th Master in 1937-38, present Treasurer and Trustee, was appointed District Deputy Grand Master of the Arlington (6th) Masonic District in 1941 and 1942 by M.W. Albert A. Schaefer, Grand Master; was elected Senior Grand Warden of the Grand Lodge December 12th, 1951, and was awarded the Henry Price Medal at his reception in Somerville Lodge on March 3rd, 1952. On March 17th, 1944, by appointment of M.W. Arthur W. Coolidge, Grand Master, he became a member of the Education Committee of Grand Lodge and on June 1st, 1952, was advanced to the position of Director of the Committee by appointment of M.W. Thomas S. Roy, Grand Master, which position he still holds. R.W. Howard A. Gray, our 28th Master in 1940-41, was appointed District Deputy Grand Master of the Arlington (6th) Masonic District in 1951 and 1952 by M.W. Thomas S. Roy, Grand Master. In retrospect, it is interesting to note that during its fifty years, Somerville Lodge has had only four Treasurers, four Secretaries and up to November 9th, 1953, when the writer retired from the position to accept the election as Treasurer, only four Marshals; but also we have had only three Tylers. This speaks well for the interest and faithfulness of the Brethren who have filled these positions. As we reach our Golden Anniversary, we look back and say "Well done" to these Brethren who have carried the burdens of the Lodge during the past fifty years. The leadership is now turned over to others with every confidence that in the coming years our beloved Lodge will continue to be a respected and time-honored Fraternal Organization in our City. By Wor. James F. Morrison. On March 25, 1968, Rt. Wor. Norman A. Ray created another first in his long distinguished career of Masonry by filling in as Inside Sentinel, a position he had never held. On June 24, 1968. Wor. Stanley L. Home presented the Past Masters' picture frame which is installed in the Banquet Hall, in memory of his father-in-law, Bro. Henry Daniel Wickham, a member of Soley Lodge. Bro. Drtad P. Boyajian presented the Past Masters' pictures, which he copied from the originals with a special process so that they would not deteriorate with age. in memory of his parents. On March 24. 1969. a letter from Grand Lodge was read in Lodge congratulating Somerville Lodge for the third highest attendance at the Lodge of Instruction in the state. This evening Mt. Horeb Lodge did the degree work in Somerville Lodge as part of the exchange which was started 40 years ago by Wor. Robert P. Jackson. On April 28, 1969, with Wor. Robert Johnston in the East, the Grand Master of Masons in Massachusetts. Most Worshipful Herbert H. Jaynes, paid a visit to Somerville Lodge to take part in the business of the evening, which was to honor Rt. Wor. Norman A. Ray. Norman was presented a captain's chair emblazoned with a Square and Compass by Somerville Lodge. The Grand Master then presented Norman the Joseph Warren Medal. For the first time, Norman was left speechless when asked to say a few words. M. W. A. Neil Osgood also spoke of Norman's great work in Grand Lodge, his twenty-five years in the Department of Education, eight years as your committeeman, and seventeen years as Director. M. W. Thomas A. Booth was happy to receive Norman from the previous administration. Norman was presented a plaque from Wor. Robert Johnston and Rt. Wor. Edward A. Prive in commemoration of the evening. After the Lights were closed, the unofficial part of the evening began with Mrs. Jaynes, Mrs. Claire Johnston and Mrs. Evelyn Ray joining in the festivities. On May 26, 1969. the Lodge voted to donate $100.00 to the Masonic Home in Charlton for the purpose of furnishing a room. District Deputy Grand Master Rt. Wor. Edward R. Nicoil presented three 50-year Medals to Bros. Leonard Stanley White, Admiral Alfred Melville Pride and Herbert Winfield Merrow. On June 23. 1969. Rt. Wor. Norman A. Ray told the Lodge that the chair presented to him at the April meeting (with gold Square and Compass on the back of the chair) was the handiwork of Rt. Wor. Edward A. Price and Bro. Douglas H. Price. At this meeting. Wor. Edward L. Conn, a very active member of our Lodge, resigned from the Board of Trustees because he was moving to Florida. On October 27, 1969. with Wor. William G. Manchester in the East. District Deputy Grand Master Rt. Wor. Edward R. Nicoil. on an official visit to the Lodge, told the Lodge that he attended the meeting on October 25, 1969, when Worshipful Manchester had the Legion of Honor conferred upon him by the officers of the Supreme Council of the Order of DeMolay. The District Deputy Grand Master, Rt. Wor. Edward R. Nicoll. was to have presented three 50-year Medals, however, Bro. Howard Chambers died before he could receive his; and Bro. Thomas Franklin Ringer had a stroke and was unable to attend. A 50-year Medal was presented to Bro. Ernest Frederick Crosby. April 27, 1970, was Past Masters' Night with Wor. Stanley L. Home as chairman, The Past Masters formed around the altar for a Memorial Service to our deceased Past Masters. The white chrysanthemums used in the ceremony were delivered to Wor. Earle W. Edwards, our only living charter member, who was a patient in the Prospect Nursing Home. On May 25, 1970, the District Deputy Grand Master, Rt. Wor. Edward R. Nicoll. again made a Fraternal Visit to the Lodge, and presented 50-year Medals to Bros. Floyd Freeman Foster, Robert Wright McEvoy. Clifford Ernest Morrissey and Lester Merton West. On May 2, 1970, our only charter member passed on to the Celestial Lodge above - Earle Wayne Edwards was bom in Asheville. North Carolina, on February 1, 1884. Entered John Abbot Lodge December 13. 19ll;Passed John Abbot Lodge January 16, 1912; Raised John Abbot Lodge March 5. 1912; Signed By-Laws in Somerville Lodge October 13, 1913;Departed May 2, 1970. Worshipful Bro. Edwards was one of 124 Masons who petitioned the Most Worshipful Grand Master for permission to organize a new lodge in West Somerville in early 1912. Dispensation was granted on December 7, 1912. and Somerville worked under it until October 13, 1913. When M. W. Everett C. Benton delivered this charter. Wor. Bro. Edwards was among the 122 Masons who signed the By-Laws; two of the original petitioners having died before the dispensation was issued. Worshipful Bro. Edwards served as Chairman of the Visiting Committee for many years and continued to visit the sick and shut-ins as long as he was able to do so. He was appointed Junior Steward in November 1940 and became Master in 1946. He served as Chaplain from 1950 to 1962 and Associate Chaplain in 1963; Chaplain Emeritus in 1967. He was presented a Citation for his outstanding service to Somerville Lodge in September 1958 by Wor. Carl K. Torossian. He served as Lodge Representative to the Board of Masonic Relief 1955 through 1966. He was elected an Honorary Member of Somerville Lodge on February 27. 1967. He was presented a 50-year Veteran's Medal in October 1962 by Rt. Wor. Herbert W. Rosen. In his retiring as Master of Somerville Lodge, he presented a check to the Lodge for a Building Fund which was the beginning of our progress into the new temple in which we now live. On June 22. 1970, the Canopy Degree Team under the direction of Wor. James E. Cushing. presented the team which was to take part in the work with Wor. Francis G. MacDonakl as Master. With the assistance of the team. Wor. Francis G. MacDonald raised his son Francis G. MacDonald, Jr. in Due and Ancient Form. During the evening, Wor. Francis G. MacDonald presented his son Francis G. MacDonald, Jr., with a certificate of Life Paid Membership in Somerville Lodge and a Certificate of Life Prepaid Grand Lodge Dues. Wor. Louis Goldstein, President of the Canopy Club, also presented Bro. Francis G. MacDonald, Jr. with a list of the participants in the Degree work and a letter opener in the form of a miniature trowel. On January 25, 1971, the new District Deputy Grand Master for the Arlington Sixth District, our own Rt. Wor. Robert Johnston, was escorted into the Lodge by Rt. Wor. Norman A. Ray on a Fraternal Visit. The Rt. Wor. Norman A. Ray presented Rt, Wor. Robert Johnston with the District Deputy's jewel originally worn by Rt. Wor. J. Arthur Gibson, our former Treasurer. Wor. Robert P. Jackson was presented his 50-year Medal at this meeting, and in his remarks. Worshipful Jackson said that the District Deputy medal presented to Rt. Wor. Robert Johnston tonight, was presented to Rt. Wor. J. Arthur Gibson in January 1929 when he was Master. Rt. Wor. Edward A. Price presented a 50-year Medal to Bro. Percy W. Poor: telling the Lodge that they had been close friends ever since the Right Worshipful came into the Lodge. Rt. Wor. Robert Johnston presented a 50-year Medal to Bro. Emil S. Hallberg and recounted Bro. Hallberg's Masonic career. He told the Lodge Bro. Hallberg had installed all the woodwork and paneling in the East of the Lodge room during the work party time in 1964-65. On April 26, 1971. Rt. Wor. Robert Johnston presented 50-year medals to Bros. Alexander T. Badger and Leslie George Williams. This was also Mt. Horeb Night and Wor. Robert P. Jackson, who originated the Lodge swap, was present and presented the Mt. Horeb team to Somerville Lodge. This swap has gone on since 1929, a period of 42 years. On June 14, 1972. Somerville Lodge lost a staunch supporter in Bro. Harry Freeto who died today. Bro. Freeto was a member of King Solomon's Lodge but a very faithful and willing worker in Somerville Lodge. On June 26. 1972. Rt. Wor. Robert Johnston, with a group from the Lacount Class of the College Avenue Methodist Church, raised his blood brother, William J. Johnston, in long form. On November 4. 1972. Junior Warden Bro. Herbert A. Mower received the Legion of Honor from Boston Chapter of DeMolay. On December 2, 1972, Somerville Lodge lost one of its great Masters with the death of Wor. Robert P. Jackson. It was he who started the Somerville / Mt. Horeb Lodge swap in 1929 which is today, in 1987. still going on with great comradeship between the Lodges. On February 19, 1973. Rt. Wor. Robert Johnston received his son. Robert T. Johnston, into Somerville Lodge and expressed his delight in the privilege of doing so. On March 26, 1973. Bro. Allen Roy Kingston received his 50-year Medal, which was exactly 50 years to the day from when he was raised on March 26, 1923. On April 23, 1973, Rt. Wor. Robert Johnston, along with some members of the College Avenue Methodist Church, raised his son, Robert T. Johnston, to the Sublime Degree of Master Mason. On May 28, 1973. Most Worshipful Grand Master Donald W. Vose was received into the East, where he introduced his suite which included M.W. Herbert H. Jaynes, Past Grand Master of Masons in Massachusetts, Rt. Wor. Lewis L. Huston, Rt. Wor. Stafford E. Davis. Rt. Wor. Lyndon W. Ellis, Wor. Roland W. Woodberry and Rt. Wor. Frederick G. Caspar. Past Junior Grand Warden; who all spoke about Rt. Wor. Norman A. Ray's accomplishments in the educational field. Rt. Wor. Norman A. Ray became a member of the Education Committee in 1944 and his contribution made it become the outstanding Grand Lodge Education Committee in all SO jurisdictions. He became Director in 1953 and held that position until 1970 when he retired. After all these praises, the Grand Master presented Norman with his 50-year Medal. Two other Past Grand Masters were also present - M. W. Andrew G. Jenkins and M. W. Thomas A. Booth. On November 26. 1973. Bro. Leon F. Dexter was to receive his 50-year Veteran's Medal but was unable to attend the meeting because of an accident. Rt. Wor. Wilbur J. Pease went to his home on November 29, 1973, and presented it to him. He was accompanied by Worshipful Master Alfred W. Bond, Senior Warden Herbert W. Mower, Junior Warden Donald A. Coutoumas and Wor. Frederick L. Tibbetts. By September 22. 1975, the Masonic Home Expansion Fund had reached its goal. Somerville Lodge participated in this project and the Master, Wor. Herbert W. Mower, thanked Wor. Paul F. Alexander for his untiring effort in this venture. In October 1975, the organist for Somerville Lodge, Bro. Joseph A. Stanley, received his 50-year Veteran's Medal in Amicable Lodge. Bro. Stanley said that he had played the organ in various Masonic Bodies over a period of 47 years but now only plays for seven lodges. On April 26, 1976. Wor. H. Bayfield Linkletter, the Lodge Secretary, was presented his 50-year Veteran's Medal by Rt. Wor. Arthur B. Savil, who said that this was the exact date of Linkletter's raising. On October 2, 1976, the Killed Craft installed Wor. Robert L. Goodwin. Jr. as Master. This was very enjoyable. Bui the evening also had an air of gloom as our Junior Past Master Wor. Donald A. Coutoumas. who opened Lodge for the evening, died during the evening. On May 23, 1977, Rt. Wor. Richard F. Norris presented blood pins to several Brothers: one-gallon pins to Wor. Bro. Robert L. Goodwin, Jr.. Wor. Bro. Frederick L. Tibbetts and Bro. William E. Morrissey and a three gallon pin to Bro. John A. Torrell. The Right Worshipful then had Wor. H. Bayfield Linkletter presented to the East, where he read "Link's" record over the years. This included his journey through the chairs to become Master in 1947 and Marshal from 1954 through 1958. This was during the time that Rt. Wor. Norman A. Ray was District Deputy Grand Master for the Arlington Sixth Masonic District as well as holding various other jobs connected with Grand Lodge. "Link" was presented his 50-year Veteran's Medal by Rt. Wor. Arthur B. Savil on the exact date of his raising, elected Secretary of the 13th Lodge of Instruction in 1956 and Secretary of Somerville Lodge in 1966. The Right Worshipful then presented a Joseph Warren or Distinguished Service Medal to Worshipful Bro. Linkletter. On June 27, 1977. Rt. Wor. Robert Johnston was unanimously elected to become an Honorary Member of Somerville Lodge. On March 27, 1978, Bro. Carl E. Johanson. Sr. was elected to Honorary Membership in Somerville Lodge. On April 5, 1978. Somerville Lodge visited Mt. Horeb Lodge and put on a First Degree. This was the 50th exchange visit between the two lodges. During the calendar year between 1977 and May 22. 1978, Somerville Lodge donated over 100 pints of blood. A Grand Lodge Certificate for 108 pints was presented to Wor. Robert Doherty. Blood Chairman of Somerville Lodge, on December 18. 1978. The Master also asked Wor. Robert Doherty to tell the Lodge about the Sixth District Golf Tourney in which Somerville won the trophy which Wor. Doherty presented to Wor. William Morrissey. Somerville Lodge was represented in the tourney by the two Bros. Robert Doherty. Bro. Robert McNary. Bro. John Torrell and Wor. William G. Manchester. On April 14, 1979, at the Masonic Temple in Arlington. Wor. Herbert W. Mower received the Legion of Honor Degree. On May 28. 1979. Rt. Wor. Irving E. Johansen presented Wor. William E. Morrissey and Wor. Robert Doherty a Citation for 163 pints of blood donated in the name of Somerville Lodge in the last calendar year. Rt. Wor. Johansen also presented Bro. Fowler with a five-gallon pin. Bro. Barry Parsons with an eight-gallon pin and Wor. William E. Morrissey with a 13-gallon pin. On September 24, 1979. Rt. Wor. 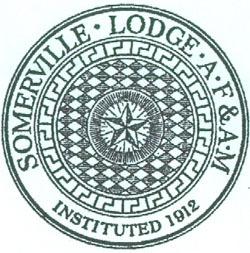 Norman A. Ray reported that Somerville Lodge, with a total officer attendance of 117 for the year, was the third in the state. We were behind St. George Lodge (137) and Paul Revere Lodge (119). but beat out the perennial champion. Thomas Talbot Lodge. Wor. Doherty thanked the Contributors who gave over $900.00 to repair the roof. Their generosity made it possible to avoid a bank loan. On January 28. 1980. Wor. Llewellyn Green received his sons Richard and David: and Wor. Frederick L. Tibbetts received his son Russell as an Entered Apprentice. On March 24, 1980. Wor. Green raised both his sons Richard and David, while Wor. Tibbetts raised his son Russell to the Sublime Degree. On May 19, 1980. Rt. Wor. Irving E. Johansen, District Deputy Grand Master, had Rt. Wor. Norman A. Ray escorted to the East, to assist in presenting a 50-year Veteran "s Medal to Wor. Herbert A. Brown, who served as District Deputy Grand Marshal for Rt. Wor. Norman A. Ray. On June 23, 1980. Won H. Bayfield Linkletter was elected to Honorary Membership in Somerville Lodge. January 25, 1982. was Wor. H. Bayfield Linkletter's night. Rt. Won Norman A. Ray spoke of the various offices and dates of their tenure regarding Link's 50-plus years of service to Somerville Lodge. Link was initiated in 1925. was Junior Steward in 1943 and Master in 1947. In 1967, he became Secretary and served for 14 years. He received his 50-year Veteran's Medal in 1976. the Joseph Warren Medal in 1977 and became an Honorary Member in 1980. On February 22. 1982, Wor. T. Walter Sharpe was presented a 50-year Past Master's Certificate in Florida by Rt. Wor. Nickles on behalf of Somerville Lodge and the Grand Lodge of Massachusetts. On February 14, 1983, a reception for Rt. Won Robert Johnston was held in a special meeting at the College Avenue Methodist Church to celebrate the election of Rt. Won Johnston as Junior Grand Warden of the Most Worshipful Grand Lodge of Massachusetts. M. W. J. Philip Berquist was in attendance with a suite of Grand Lodge Officers. The Grand Master presented Rt. Won Johnston with the Henry Price Medal. On June 27. 1983, District Deputy Grand Master Rt. Wor. Charles E. Myers was received on a Fraternal Visit to the Lodge. He in turn received Rt. Wor. Robert Johnston, Junior Grand Warden for the Grand Lodge of Massachusetts. On September 26, 1983, the new officers' aprons were dedicated in memory of Won H. Bayfield Linkletter. On November 28. 1983. Bro. Carl E. Johanson, Sr. was presented his 60-year pin. On February 27. 1984. Wor. Arthur Costa gave a new American flag to the Lodge. The flag had flown over our nation's Capitol on November 16. 1983. On June 25. 1984, Bro. Joseph Cunha presented a beautiful hand-carved clock to the Lodge. On January 28, 1985, the Lodge received a Certificate of Appreciation from Sergeant Hickey of the U.S. Marine Corps for its participation in the "Toys for Tots" drive before Christmas. On April 22, 1985, Won Warren Bean. Master of Mt. Horeb Lodge, presented a new Trestle Board to Somerville Lodge in commemoration of the many years of friendship between the two lodges. On May 27. 1985, Rt. Won Mervin Chandler presented Blood Certificates to Bro. Richard Nicholas, Bro. Donald A. Coutoumas. Won Robert Doherty, Wor. William E. Morrissey and Won Robert Goodwin. Jr.. as well as one for Won Goodwin's wife Etta, who participated in the blood program for the Anniversary Year. On January 26, 1987, our own Rt. Wor. Robert Doherty was received and introduced to the Lodge by Rt. Wor. Robert Johnston as the new District Deputy Grand Master for the Arlington Sixth Masonic District and was presented his District Deputy's jewel which was previously worn by Rt. Wor. J. Arthur Gibson and Rt. Wor. Robert Johnston. November 23. 1987, tonight Rt. Wor. Norman A. Ray who was the 25th Master of Somerville Lodge, now stands as a 50-year Past Master of Somerville Lodge. He is still an active member and a dedicated Mason. M. W. FREDERICK W. HAMILTON, our 1st Master and Charter Member, was appointed Deputy Grand Master on December 27th, 1914, by M. W. Melvin Maynard Johnson, Grand Master, but only served in that position until March 10th, 1915, when he resigned to be elected Grand Secretary, a position he filled with great honor and ability until his death in May 1940. On December 11, 1935, he was elected an Honorary Past Grand Master being only the second Brother to receive this distinction in the history of our Grand Lodge. On the same date, he was awarded the Henry Price Medal, the most prized of all Medals awarded by our Grand Lodge. During his long Masonic career, he served two Lodges as Master, Washington Lodge, formerly of Roxbury but now located in Lexington and a member of the Somerville (6th) Masonic District, and our own Somerville Lodge. He was awarded the Veteran's or 50-year Medal in 1931 and was elected an Honorary Member of eight other Lodges. RT. WOR. J. ARTHUR GIBSON, our 13th Master in 1925-26 and Treasurer of our Lodge from 1934 to 1953, was appointed Grand Sword Bearer in 1928 by M. W. Frank L. Simpson, Grand Master: District Deputy Grand Master of the Arlington (6th) Masonic District in 1929 and 1930 by M.W. Herbert W. Dean, Grand Master, and on December 12. 1934, was elected Senior Grand Warden. At his reception in Somerville Lodge on February 18, 1935, he was awarded the Henry Price Medal. WOR. T. WALTER SHARPE, our 19th Master in 1931-32, was appointed Junior Grand Steward December 27, 1932, by M. W. Curtis Chipman, Grand Master. RT. WOR. STANLEY W. WILSON, our 20th Master in 1932-33, was appointed Senior Grand Deacon on December 27. 1934, by M. W. Curtis Chipman, Grand Master: District Deputy Grand Master of the Arlington (6th) Masonic District in 1935 and 1936 by M. W. Claude L. Allen, Grand Master, and on December 27, 1945, was appointed Deputy Grand Master by M. W. Samuel H. Wragg, Grand Master; and was awarded the Henry Price Medal at his reception in Somerville Lodge, February 12, 1945. RT. WOR. NORMAN A. RAY, our 25th Master in 1937-38, present Treasurer Emeritus and Trustee, was appointed District Deputy Grand Master of the Arlington (6th) Masonic District in 1941 and 1942 by M. W. Albert A. Schaefer, Grand Master; was elected Senior Grand Warden December 12. 1951, and was awarded the Henry Price Medal at his reception in Somerville Lodge, March 3. 1952. On March 17, 1944, by appointment of M. W. Arthur W. Coolidge, Grand Master, he became a member of the Education Committee of Grand Lodge and on June 1st, 1952, was advanced to the position of Director of the Committee by appointment of M. W. Thomas S. Roy, Grand Master, which position he held for 18 years. He was appointed by the Grand Lodge of Connecticut as Grand Representative to the Grand Lodge of Massachusetts in 1952. which position he held until 1984 and served as Grand Organist under M. W. Donald W. Vose, Grand Master. RT. WOR. HOWARD A. GRAY, our 28th Master in 1940-41. was appointed District Deputy Grand Master of the Arlington (6th) Masonic District in 1951 and 1952 by M. W. Thomas S. Roy, Grand Master. RT. WOR. EDWARD A. PRICE, our 43rd Master in 1955-56, was appointed District Deputy Grand Master of the Arlington (6th) Masonic District in 1965 and 1966 by M. W. A. Neil Osgood. Grand Master. WOR. STANLEY L. HORNE, our 52nd Master in 1964-65. was appointed Junior Grand Steward in 1967 by M.W. Thomas A. Booth, Grand Master. RT. WOR. ROBERT JOHNSTON, our 56th Master in 1968-69, was appointed District Deputy Grand Master of the Arlington (6th) Masonic District in 1971 and 1972 by M. W. Herbert W. Jaynes. Grand Master; appointed to the Education Committee in 1973 by M.W. Donald W. Vose, Grand Master; elected Junior Grand Warden in December 1983; awarded the Henry Price Medal at his reception in February 1984. He was appointed by the Grand Lodge of Connecticut as Grand Representative to the Grand Lodge of Massachusetts in 1984, which position he still holds: and was appointed Grand Lecturer of the Grand Lodge in 1984 by M.W. David B. Richardson. Grand Master, which position he still holds. RT. WOR. WILLIAM G. MANCHESTER, our 57th Master in 1969-70, was appointed Grand Sword Bearer in 1981, 1982, 1983 by M. W. J. Philip Berquist, Grand Master; was appointed District Deputy Grand Master of the Cambridge (2nd) Masonic District in 1984 and 1985 by M. W. David B. Richardson, Grand Master; and was appointed by the Grand Lodge of Benito Juarez. Mexico, as Grand Representative to the Grand Lodge of Massachusetts in 1984. which position he still holds. RT. WOR. ROBERT F. DOHERTY, our 65th Master in 1977-78. was appointed District Deputy Grand Master of the Arlington (6th) Masonic District in 1986 by M.W. David B. Richardson, Grand Master; and in 1987 by M.W. Albert T. Ames, Grand Master. WOR. ROBERT J. McNARY, our 69th Master in 1981-82, was appointed Senior Grand Steward in 1985 by M.W. David B. Richardson, Grand Master. As we reach our Diamond Anniversary, we look back and say "Well done" to those Brethren who have carried the burdens of the Lodge during the past 75 years. The leadership is now turned over to others with every confidence that in the coming years our beloved Lodge will continue to be a respected and time-honored Fraternal Organization in our City. A new Masonic lodge has been started in West Somerville, Mass., under very favorable auspices. With the able and experienced Masons who are at the beginning of the undertaking it is bound to succeed. The lodge was instituted Saturday, December 7th by Most Worshipful Grand Master Everett C. Benton, under the name of Somerville Lodge, the ceremony taking place in Fraternity Hall in the presence of over 200 members of the order. Most Worshipful Grand Master Benton was accompanied by Right Worshipful Master Harry P. Ballard, Senior Grand Warden; Charles S. Robertson, Junior Grand Warden; Thomas W. Davis, grand secretary; Frank W. Kaan, grand treasurer; Frank E. Buxton, Grand Marshal; Joseph H. Gleason, W. H. H. Soule, Frank W. Meade, William H. Oliver, district deputy grand masters, and Most Worshipful J. Albert Blake, Past Grand Master. The officers installed were: Dr. Frederick W. Hamilton, Worshipful Master; Albion H. Libbey, Senior Warden; Alfreda R. Hersam, Junior Warden; Frank A. Teele, Treasurer; Charles W. Hodge, Secretary. The installation was followed by a banquet and speeches in Columbian Hall. The new lodge will hold regular communications ln Fraternity Hall. Most Worshipful Everett C. Benton, assisted by officers of the Grand Lodge of Massachusetts, presented a charter to Somerville Lodge, West Somerville, Mass., Monday, October 13th. A special communication of Grand Lodge was opened in an apartment adjoining the main lodge room. Rev. Dr. Frederick W. Hamilton, who has been worshipful master of Somerville Lodge since its inception, appeared and requested that it be constituted according to the ancient usages. The grand officers assumed their stations within the lodge room. At the right of the grand master was seated Most Illustrious Edgar W. Evans, grand master of the Grand Council, R. and S. M.
Among the officers assisting Most Worshipful Grand Master Benton were: William H. L. Odell as Deputy Grand Master; Leon M. Abbott, Senior Grand Warden; Charles W. Schuler, Junior Grand Warden; Charles H. Ramsay, Grand Treasurer; Thomas W. Davis, recording grand secretary; Dana J. Flanders, Most Worshipful Past Grand Master; Rev. Edward A. Horton, Rev. Dr. R. Perry Bush, Grand Chaplains; George C. Thacher, Grand Marshal. Each of the Masonic bodies located in Somerville were represented by their officers. Prayer was offered by Rev. Dr. Bush and Acting Deputy Grand Master Odell, addressing the grand master, said that the members of Somerville Lodge desired to receive their charter, which the Grand Master said would be done, a committee having found every thing satisfactory. The charter was read by Recording Grand Secretary Davis and those whose names were upon it assembled at the altar. There they gave assent to those selected as master and wardens. The Grand Master declared that it was a personal pleasure for him to carry out the request of the lodge, especially in view of the fact that its Master was Dr. Hamilton, and he was glad that it had been his privilege to give the lodge its dispensation as well. After the grand officers had taken their places in the center of the apartment the exercises of the floor were conducted by the acting Deputy Grand Master, Senior and Junior Grand Wardens, by the libations of corn, wine and oil, with prayer by Rev. Mr. Horton. In the installation the Wardens, Treasurer and Secretary placed the jewel upon the corresponding officer, while the acting Deputy Grand Master inducted the appointive officers. When the proclamation had been made by the grand marshal, the grand master delivered an address congratulating the ledge and its officers and wishing for it all prosperity. There were three bouquets presented, one each to the grand master and marshal and the other to Grand Secretary Davis, to be conveyed as a loving token to his daughter, who is ill. The organization of Somerville Lodge is as follows: Rev. Dr. Frederick W. Hamilton (P.M.), W.M. ; Albion H. Libby (P.M.). S.W. ; Alfredda R. Hersam, J.W. ; Frank A. Teele, T.; Charles W. Hodge, S.; Rev. George B. Dean, C; Ezra F. Baxter, M.; Clifford F. Crosby, S.D. ; Arthur E. Keating. J.D. ; Robert F. Gibson, S.S.; William F. Dodge, J.S. ; Frank W. Seabury, I.S. ; Alvah G. Sleeper, Organist; George H. Ireland, Tyler. The new Masonic apartments of Somerville Lodge at Davis Square, West Somerville, Mass., were dedicated by the Grand Lodge, Thursday, June 21. The exercises began at 7.30 o'clock previous to which the Grand Lodge officers were entertained at supper in the banquet hall connected with the apartments. Worshipful Master Clifford F. Crosby presiding. The Grand Lodge officers included Most Wor. Leon M. Abbott, Grand Master; Rt. Wor. Moses C. Plummer, Deputy Grand Master; Rt. Wor. William M. Farrington, Senior Grand Warden; Rt. Wor. Edward L. Chase, Junior Grand Warden; Rt. Wor. Charles H. Ramsay, Grand Treasurer; Rt. Wor. Frederick W. Hamilton, grand secretary; Rt. Wor. Clifford M. Brewer, District Deputy Grand Master of the district; Wor. R. Perry Bush, D. D., Grand Chaplain; Wor. Edward N. West, Grand Marshal; Wor. George T. Bailey, Junior Grand Deacon; Wor. John H. Blodgett, Wor. Clarence A. Russell, Wor. Percy W. Witherell, Grand Stewards; Wor. J. Everett Brown, Grand Sword Bearer; Wor. William A. Laughton, Grand Pursuivant and Wor. George W. Chester, Grand Tyler. There were also many permanent members of the Grand Lodge and a large number of the members of Somerville Lodge and other brethren in the Company. The ceremony of dedication was in accordancs with the ritual. An interesting address was made by Grand Master Abbott also by Rev. Brother Bush. There was singing by a quartet. The exercises were of marked interest. This page was last modified on 27 December 2018, at 07:54.